In 2017, the number of Facebook users exceeded 2 billion. This is almost 1/3 of the global population! Facebook is the most popular social media portal in the world. Therefore, there is no doubt that every ambitious project should find its place in Facebook. A well-thought-out fanpage is the foundation for all marketing activities. It is worth remembering that a user of today is extremely demanding; therefore, ordinary entries on a wall may not be sufficient to make him or her interested. If you don’t want your Facebook activity to be lost in the abyss of ordinary and typical fanpages, invest in a Facebook application. Our interactive agency, in addition to developing fanpages, also creates dedicated applications for Facebook. They make users involved, let them choose data, and keep you constantly in touch with your customer. Facebook applications are by far the best tool for building a brand image in social media. What can we do for you within Facebook? With every Facebook application, we provide access to an administration panel, which makes it easy to manage your content, questions in quizzes, competition tasks, etc. 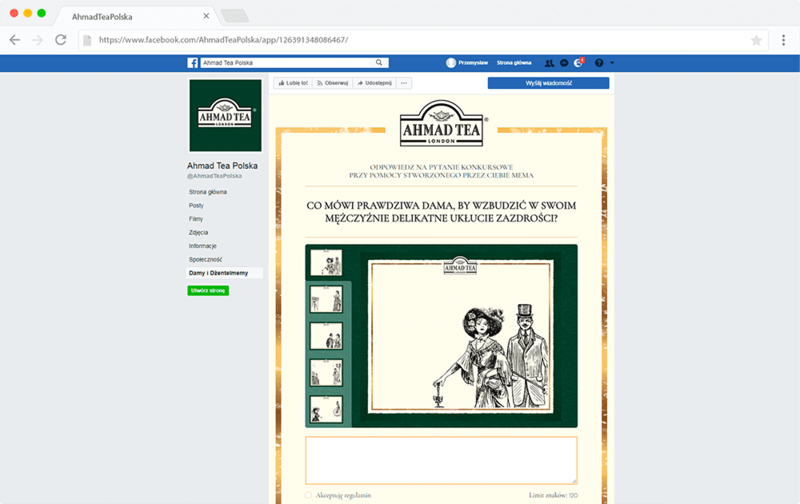 For Levant, a distributor of Ahmad Tea London, we created a contest application with a meme generator. An administrator can easily manage all entries and select winners. And all these functions are integrated with a Facebook application!